contingent upon understanding words and expanding reasoning. Creating goals for verbal intelligence is imperative to increasingly develop knowledge and verbal skills beyond the learner's present competence. Substantial evidence exists that a student's vocabulary range and abilities with words correlates with career success. The IEP team can help enhance reasoning skills that offer the learner the capability to achieve a sense of control and direction over his or her own life. When the child masters a particular skill, a new objective may be added. As skills grow easier, more difficult goals should be added. The main idea of setting benchmarks revolves around encouraging the learner to use the goal-setting behaviors independently in various environments and situations. These benchmarks foster the student's ability to accomplish anything that markedly affects his or her daily life. Design expected outcomes around tools and activities that augment verbal skills expansion. For example, design goals related to a student always having a dictionary or thesaurus handy. An anticipated outcome can revolve around word power, requiring the student to spend time with the dictionary every time a new word is encountered. Use those expectations to help teach new meanings and derivatives of words as well as check the spelling of uncertain words. Develop goals that increase reading to develop abilities with words, expression, comprehension of concepts and knowledge acquisition. Reading aloud with a partner helps exercise active listening, discussion and opinion, which all promote verbal intelligence skills. Come up with desired outcomes that help the learner remember the words by using the words in context. 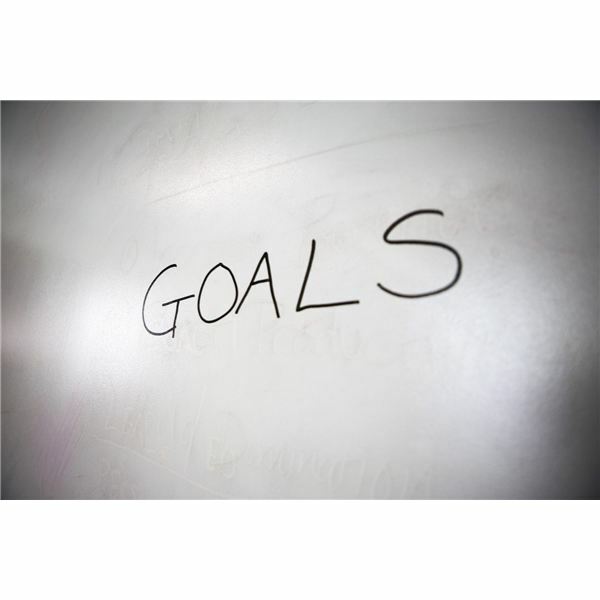 Writing goals offer a means to polish skills, editing and rewriting to improve writing or cut out repetitive or unnecessary material. Creating IEP goals for language reasoning centering on word games can foster reasoning and verbal dexterity. Suggest expectations that increase verbal intelligence with the implementation of mental exercises – like crossword puzzles, anagrams, code-breakers, rebuses, word searches and scrabble. Foremost, encourage children with goals that make them reason throughout the day. The basis for concept development should be real experiences and events. If the goal of a learner is to speak about his or her daily experiences (routine or sequence of an event) it helps the student to process by comprehending sequences. The attainment of these goals becomes much easier when students are encouraged to explain or talk through their reasoning process when problem solving, including the logical relationships among things. Consider, when creating goals the process of classifying, same/different, one-to-one correspondence, cause and effect, matching, and spatial relationships. Additionally, when creating IEP goals for language reasoning, keep in mind a balance of listening and talking that is appropriate for a learner's age and abilities, i.e., verbalization for the student whose communication skills are limited as well as allowing enough time for a student response. Expand Your Verbal Intelligence, Sloane, Paul, on Lifehack.org. Special Education Services: Examples of IEP Goals and Objectives Suggestions For Students With Autism, on SpecialEducation.us.